THIS ARTICLE TELLS A DIFFERENT STORY. ONE THAT MOST MUSICIANS OF VINNIE COLAIUTA'S CALIBRE DON'T DARE TO MENTION, LET ALONE DISCUSS. There is a new generation of musicians being born, not so much for their musical sense as for their business sense, and musicians as a whole stand to gain very much from them. Problems shared by successful, working, respected, idolized musicians, that until now have not been read or written about with such candor, or even dealt with in learning institutions, problems so serious that these superstar musicians all face and must learn to deal with or not be heard of again. Problems such as waiting for the phone to ring - How can that be? They're supposed to be always working. – studying reading, rudiments and technique - They have already made it. They are the superstars. They know everything, - the unreliable, political music business, the intangible product that musical sound is and that must sell, and on and on. In this interview, Vinnie Colaiuta frankly and thoroughly discusses all these touchy, "hands-off" topics, as he relates his personal victory with the music struggle. "I think the only thing worse than the music business is stand-up comedy. It is tough to maintain any kind of job. You could be hip today and tomorrow you are nothing. It is so transitory and trendy you just never know. This puts extra pressure on you because it's like a do or die situation. I can't really complain though. I bought myself a house and financially, I'm looking pretty good." Vinnie is making a comfortable living in music. He has been busy with a tour and album deal with Lee Ritenour, and before that, there was Tom Scott, Joe Cocker, Joni Mitchell, Chaka Khan, and the "Who's Who", to name a few. 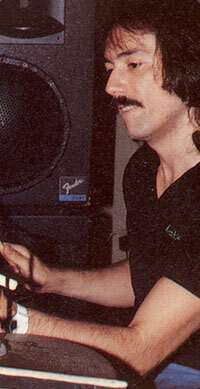 He played on Barry Finnerty's record, Maurice White's record, the Commodore's and Sembello's record. All this in addition to juggling studio gigs. "But, this isn't a steady gig either and the reason why I left Frank was because I wasn't on a retainer, so it is six of one, a half dozen of another. It just seems that the musical market is more thriving in Europe and Japan than it is over here in the U.S. So it's almost like you have to go over there to play the real stuff and come back here to do the bread and butter stuff. Even Japan is becoming over saturated with musicians. Nobody can work over here so they are going over there and the golden land of musical opportunity is not so anymore. What's even funnier is that you can buy a synthesizer cheaper over here." THE BREAD AND BUTTER STUFF. THAT'S ALL VINNIE EVER WANTED SINCE HIS FIRST ROAD GIG. That, and to play good music, of course. Fresh out of the Berklee School of Music, Vinnie was exposed to many good people and he was burning. He did top forty gigs around Boston and Cape Cod, playing with the Christopher Morris Band until producer, Al Kooper of the "Blood, Sweat and Tears" and the Blues Project, heard a demo tape of the band. He decided to produce an album with the band and Vinnie was asked to get some players together for a tour. He asked the hit jazz players from Boston - Stanton Davis, who had his own band called "Ghetto Mysticism", Gary Valente, bassist Tim Landers, and saxist Dave Wilczewski, presently with Vital Information. He felt like this bus tour of the United States was his first gig (even though he has been professionally playing since he was 14) and he loved the exposure and the experience. The band cut their LP at the Record Plant in Sausalito where they stayed a couple of months. That was Vinnie's first recording and he felt his inexperience. 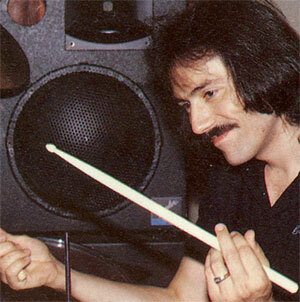 "I didn't know anything about studios; I didn't even know how to get a drum sound. I learned really fast just from doing. I learned how to get a drum sound and how to play on a record." 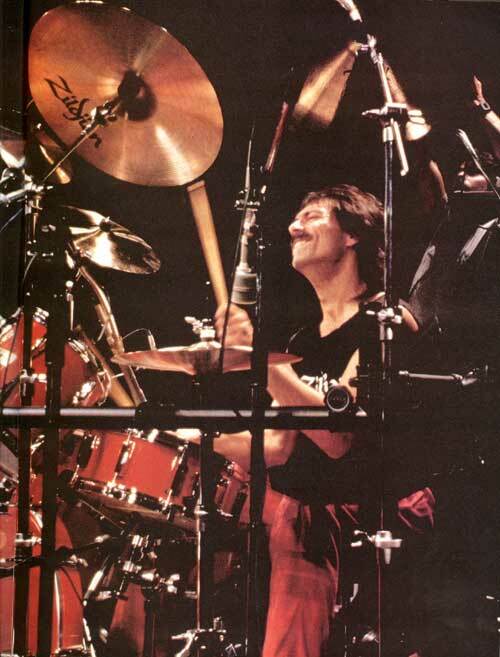 It was such a positive experience for Vinnie that he wanted to move to California to play record dates, and early in 1978, Vinnie Colaiuta was the new hip drummer to descend upon the L.A. studios. There were no open arms waiting for him and he moved into the studio scene slowly. It wasn't easy but after four months he heard through the grapevine that Frank Zappa was auditioning drummers. "I started calling up the management and started hounding them and hounding them until they told me they would listen to me. It was a Wednesday evening and I was to go to the Culver City Studios. It was a big movie studio and there were drummers going in and out. I just played and did my number." The rest is history. 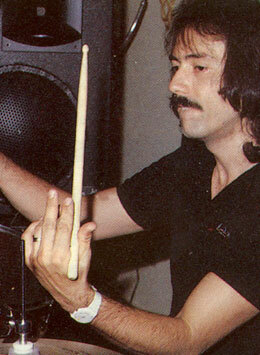 Vinnie got the gig that night and remained with Zappa for two and a half years during which time he experienced polyrhythmic growth and developed an individual style. This was Vinnie's key career move, not only because he was playing with Frank Zappa, the name, but because Frank, the musician, presented such musical challenges that Vinnie accepted and dealt with so proficiently. "I tried to actually sound like Tony Williams when I played certain things; I tried to play like Steve Gadd when I played other things; I tried to sound like David Garibaldi for other things; and I really got into Billy Cobham for other things, to the point where it just melded together and my own style emerged. I knew that I was sounding a lot like other people and I wanted my own identity. I don't know how it came about because it was so evolutionary but, I knew my style wasn't going to come out by copying somebody else. My brain must have said, 'you're copying this guy. No, go to him. No, don't. Do this, do that', and I came out with myself. When I was playing with Frank, I had to find a way. There, I was presented with something different on the drums that I could not rely on my predecessors to show me how to play. I could draw on their influences to play fusion beats and certain licks but when it came to applying polyrhythms, I had to do it my own way." One instance, stands out as Vinnie recollects how he came up with his own way of playing reggae even though he had never heard reggae played before. Now, drummers imitate his reggae lick! "I was in London with Frank and he wanted to play a reggae tune. I heard one thing and I knew the bass drum was on 2 and 4 and I just took it from there and made up my own thing. The beat was kind of a swing, not straight eighths up and down, but subdivided so I had some room to play around and it went over. People liked it. Then, I heard the authentic stuff and mixed that in with it. So I kind of went about it the backwards way. I once heard Steve Gadd play one reggae groove on a Joe Cocker record and I said, 'Yeah, that's it.' So, a lot of my stuff came from groping and I came up with my own style. But, sometimes I still play stuff that sounds like someone else and I don't cover it up. Like, Gadd played something that I love and it's a great move and I'll play it if I can pull it off, if I am playing the kind of music that warrants it. Since Steve recorded so many things with Tom Scott, it was like he wrote the book on it. At least, I couldn't find a way to play it any better than he played it, so it felt comfortable for me to assimilate his way. I didn't sound exactly like him. It's like one saxophonist playing 'In The Mood' and another saxophonist plays the same melody. It is not going to be exactly the same, but it will be close." Vinnie's last gig with Frank was in December, 1980. Though Frank was paying him good money, he was gone too long to get any studio dates when he was back in town in between gigs. And he wasn't making enough money to get ahead. He knew he could have taken it a lot further, but he wanted to move on to other areas. "I wanted to take what I had learned and apply it to other things but I found out soon enough there was no room for it anywhere, unless I did my own thing which I still haven't really done yet. Music is like language - if you don't speak it, it stays up in your head and you just stammer at it." Then, through recommendations he auditioned to record with Gino Vannelli. "It takes somebody to have enough trust in you that you are not going to make them look bad, to stick their neck out on a chopping block for you." In Vinnie's case, guitarist Carlos Rios, Lionel Richie's musical director and bassist Neil Stubenhaus, both believed in Vinnie's ability and character. Vinnie proved true and working with Gino, plus playing with a group called "Pages" (now "Mister Mister"), provided the exposure he needed within that circle of recording artists. Soon he was working with Tom Scott, touring and recording, and dates started to come in and he was able to stay in town and make his living. "I just wanted to be able to be domestic and go out of town if I wanted to. Just make a living doing dates. Of course, I didn't want to become a munchmeat who did any kind of date because there weren’t enough record dates to go around, but I wasn't going to turn down a TV date, even though I preferred doing records. Actually, I walked into some pretty good stuff; Tom Scott wrote for TV and Patrick Williams wrote good TV material. Now I worry that if I go out of town for too long, that the studio scene will flake out on me. It's the same old story." THERE ARE SEVERAL COMMON DENOMINATORS THAT OCCUR IN THE STUDIO. Vinnie, anxious to please, became an expert. "You get a sense after playing a while; you just know what works and doesn't work from the experience of doing it over and over on other peoples' records. If you know that what is happening vocally you are not stepping on the singer's toes and you know what is happening is a good feeling in the room, and you go into this guy's date and he says 'no, don't do that. It doesn't work', and you are seriously being given the clamp, then you are talking about limitations. But, if it's a thing where you are not sure your thing is right and you are groping or if the guy gives you a framework to work in which presents a challenge but part of the contingencies of that challenge is that you can't play quick, for instance, you can't think of that as a limitation. You have to accept the challenge, know what to do with the music and document it the right way forever. That is all that exists when that record is put on the turntable and that five minutes is expiring. So, if the drummer thinks that a qualification is a limitation, he is not ready to document it. But, on the other hand, if he met the challenge, saw no limitations, worked within the idiom and idiomatically created something, he was being creative." ON A PERSONAL LEVEL, VINNIE ADMITS THAT THERE HAVE BEEN SOME CHALLENGES, THOUGH MOST OF THE STUFF HAS BEEN "JUST GO IN AND DO IT." Calling up certain attitudes to come through in his playing he found real challenging. "I get some dates where I have to try to get a certain attitude, a certain style to convey somebody's emotion. Burt Bacharach is real abstract. I found it very vague how he wanted the stuff to groove and how he wanted the drums to be touched. He's a great writer and musician, but there are big people like that. There were a lot of things that were hard with Frank. Some of the things for cutting 'Joe's Garage' were pretty difficult at the time, but I had fun with that stuff. I was pretty at home with it." Probably one of the most surprising side effects of studio gigs is that most of the time you don't have to read anything that is challenging; therefore, "your reading slouches and you sometimes can get so involved in playing just on the drum set, you can forget the little things that give you extra polish." Vinnie is back to practicing rudiments, reading and technical exercises. "I am trying to change my technique and it's hard because I have to practice the same pattern that I did for years in a different way. And now that I am 30 years old, to do it with the same fervor I had when I was 15 is a little harder, as much as I love the drums." 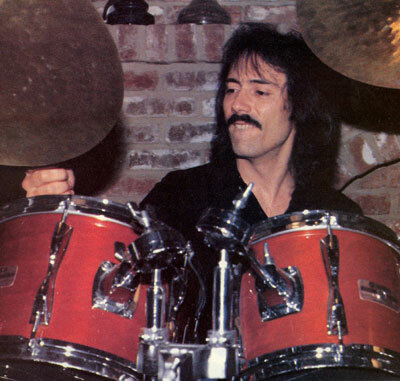 As a child, Vinnie was a natural drummer practicing on pots and pans and toy drums until he graduated to a Roger's drum set, a gift from his parents. He grew up listening to Motown, and the Beatles, and Buddy Rich and when his mother encouraged him to take formal lessons, he took to Haskell Harr instantly. He practiced, joined the school band, and became section leader. And talk about incentive, he began playing professionally at 14. "They were really dumb gigs, like the worst kind, and I was still going to school so at 1:30 in the morning we would be playing some slow tune and I would fall asleep behind the drums and the guy would turn around and kick my bass drum and wake me up. It was so funny!" His next gig was a bit more interesting. He played with a top forty's band and played Deep Purple, Cream and Led Zeppelin gigs on the side. "In the kind of rural area I was living in (outside of Pittsburgh, Pennsylvania), if your parents were not into Count Basie and jazz, and mine were not, who's going to turn you on to it?" By coincidence he met Steve Smith who was playing in a bar with a big band. Steve mentioned that he was going to go to Berklee which started Vinnie thinking. He applied and was accepted and met up with Steve and they became good friends. "When I went to Berklee that's when all the stuff really broke loose. The whole concept of how to play was right there in front of me, because these guys knew stuff that nobody was hippin' me to back where I was living. I saw what I had been missing conceptually all those years. I put my cymbals up; it was a different bag from having my ride cymbal down and playing and trying to emulate Buddy. So I just totally imbibed myself with Tony Williams, Miles Davis, Mahavishnu Orchestra, Alphonse Mouzon, and it was like a light bulb shot off." And Vinnie's rhythmical light still shines today through his technique, his groove, and his dynamic playing. With ninety percent of the records you hear recorded with machines, it is evident that studio drummers are concerned about the seemingly electronic takeover in the contemporary music scene. Vinnie is no exception and adamantly discusses some surprising feelings regarding the acoustic/electronic music controversy. "Because of the technology the studio thing now is in a weird place. There are so many machines on the radio that even the guys that are in the bands program the stuff. The new thing is to have a rack. They show up for a date with an octapad and a sampler, a rack full of outboard gear, some MIDI compatible equipment and they could trigger whatever sample from an octapad, play or program a groove on the machine and overdub fills or just play live to a click and they would be making do just fine. A drummer has to do that now. There is a drummer's way of thinking and a drum machine is set up to emulate a drum kit. But the other side of the coin is that a lot of keyboard players and other people who have good rhythmical concept, even engineers, or a producer, can press buttons and translate the stuff and he might even have some pretty hip ideas that a drummer wouldn't think of because a drummer thinks too drumistically. I guess the idea is to just be a musical drummer and a musical programmer as well and not think too much like some chops guy that doesn't have an idea how to interpret tunes. If you have musical sense and you know how to interpret the stuff and you play drum set, you will probably shine through when you program too." "I THINK A LOT OF THE PEOPLE ARE STARTING TO THINK THAT IF THEY GET ON TO THE EQUIPMENT, THEY WILL HAVE ALL THE LATEST, HIP SOUNDS AND IT WILL MAKE THEM SOUND GOOD. The fact of the matter is that no matter how much equipment you have, you still have to have the talent. I mean, a little kid can go and sample and play alone with his little drum, but that does not mean that kid is going to develop. A kid who doesn't have to whack the drums hard and get a feel for drums to me is kind of missing something. He is going to buy a bunch of pads and not even know what it is like to lay into a bass drum." "It's like piano and synth. I couldn't imagine getting chops on a synthesizer unless you know how to play piano. There is a direct physical link between a human and the drums that, as far as I'm concerned, you just can't get with the machines. And the beauty of it is not hitting it the same volume every time and not in the same spot. It's the little nuances that make the difference. When you hit a pad, it triggers a pick-up that creates voltage. Maybe it does it faster than a drum head vibrates and the electronic drum brain is a great alternative for sounds, but you just can't recreate that physical interaction you get with acoustic drums." "I don't think the electronic drum brain can translate two small notes played on a drum. It measures it and spits it out exactly, whereas on a drum it was not meant to be exactly the same. The microprocessor turns voltage into sensitivity. Wonderful. But it's not the same as hearing a cymbal encompass your whole body, or hearing a bass drum, or if you stand in front of a giant gong and you feel those waves go through your body. Sure, with electric you can feel the PA speakers through the floor but you don't need that to get it from a gong or drum set. It's just different." "When you're a drummer you might sit down and play a beat because of the way is physically feels, instead of thinking out every note, and it could be a great groove. You know how you just hit on something without thinking about it. You just don't hit on things from a machine. There is no spontaneity, you just don't start jamming on the pads. But, an advantage of the machine is that it will help you think more about what you are going to play on the drums and you can play stuff that you physically might not attempt. After a while you will know your boundaries. Like, there is no way I am going to play thirtysecond notes on the bass drum. Who could do it? And that clean too! You know it's a machine." "NOW I’M GETTING TO THE POINT WHERE I WANT TO DO MY OWN THING. I am really interested in composition and I’ve been learning to write. When I got the drum machine and a synthesizer and started plodding my way around the keyboard, it opened a whole new avenue for me with writing. The sequencer made it even easier. At first, I thought, 'Well now, this stuff is going to make it! Anybody can go out and make their own record.' The fact of the matter is, it is not going to make you write a good song." "A lot of people who are making these kinds of records have good songwriting sense, and good pop music arranging sense, enough to utilize these machines. They know how to construct songs to sound a certain way and the machines play a valid part in that type of music. The machines opened up a whole new area of sounds that can be used to create rhythmical, emotional statements that you might not make with the drums because you can only get so many kinds of sounds out of drums and cymbals." "Sound-wise, electronics opened a whole new area. But, it's to the point where it is just blown so far out of proportion. Like, take these remixing guys. Some of them just put the tape on a splicing block. They edit it, feed stuff into it in AMS and sample it and chop it up and remix with weird kinds of delays and all the stuff that they use. Of course, to them they are being artistic. But, it's so blown out that sonically they are doing so much to the sounds of the instruments that it's just not documenting the performance anymore." "When you are recording you have to perform with the knowledge that it has to sound a certain way. In the old days, when you went into the studio to cut a jazz record or something, you just heard it in your headphones like it was being recorded. When you heard a bunch of echo, you knew you couldn't play certain kinds of licks because it was going to get washed out; when you heard the gated tom-tom, you knew how to approach the record because this guy has the next part; you couldn't get in the guitar player's way. Everybody has their own little building blocks of things that goes together to record. Now, it is different. You have to play ahead of time with how the sound of the drums is going to be affected and they tweak it more to make it. So, the engineer has just as much to do with the final sound as the composer." "But, what does it have to do with music and pure notes? It really doesn't have anything to do with it. It's at a turning point and I am real interested to see which way it is going to go. If acoustic and electronic will be a successful marriage, or if one is going to tug too much away from the other side." "What I really got into was writing stuff that I could play off of in clinics. I'd, write some stuff that had rock grooves to it, and some stuff that had funk to it, so it was kind of a mixed bag. People responded favorably to what I was writing and that inspired me to do more. I'm not sitting down and trying to come up with a vocal tune. I have just been writing pieces that showcase me as a player and still stand up as pretty good music. I want to write some things that would showcase some polyrhythm stuff and some groove tunes, some nice tunes, soul vehicles, some things that are real airy, different bags to play in. Writing is like a new fire. I don't know what I will make out of it, but I enjoy it." "I feel like I did try a few different things. Like, I was using Simmons and stuff in clinics when not many people were using them and I started playing tapes during my clinics and I didn't see many people doing that. Now, it’s catching on and people are doing dual clinics, like I did with Tim Landers, or playing with tapes of their tunes." Several major musical occurrences happened to Vinnie over the past few years, and not all good. One really great musical situation he was proud to be involved with was a group formed by Joni Mitchell's husband, Larry Klein. Larry and Vinnie played jazz for restaurant gigs and he was impressed with Vinnie's playing ability. He called Vinnie because he was forming a group to play with Joni that involved guitarist Mike Landau, and keyboardist Russ Ferrante. "It was a really great, great musical situation because it was so intimate and the quality of playing was very high, studio quality. It was really great to work with Joni as an artist. We could play in big arenas and we didn't have to come off like a tech 'bull' band." There was, however, one very big disappointment that stands out in Vinnie's musical career. While he was performing a drum clinic in Germany last year, he received an urgent phone call to go to England to play with Jeff Beck. He flew to London, went to Jeff's house and they played trio with the bass player, Doug Wimbish. He was accepted and was to go to Japan with them (Jan Hammer was to play with them, too). "It was a month before we were supposed to leave and I was all keyed up. I had this gig coming up with Jeff Beck! I couldn't believe it! I didn't tell anybody to not jinx it." Simon Philips couldn't do the gig because he had some things going on with Pete Townshend. About a month before the tour, the gig with Townshend folded and he called up Jeff Beck and was rehired. "I was destroyed. The floor just collapsed for me." So, Vinnie learned to roll with the punches. Every profession has its share of downs; it just seems that the more a profession has to do with an art form, the harder the blows. And Vinnie matured. "You have to be able to do several things that you know will last the whole period of a lifetime." He began to realize what a wealth of information he had gathered and to assess his own worth as a musician and as a person. "All my life I have played my drums, and I have an identity of a good drummer but that's not the same kind of identity as being a good person and what you feel about yourself and how people see you. People who are playing all the time tend to neglect that but drumming is such an important part of my identity that it feeds my other self too. It's like one person feeds the other. If the other self is not happy, the drumming self will be affected. If the drumming self is good, then that makes the other self feel good. I see a lot of hope and promise because there are a lot of ways people can make music. If I can make the changes and adapt those changes to other changes that I am not making and still be in demand as a player because my craft or my art did not become obsolete, then I'll be in good shape." WELL, VINNIE'S PERSEVERANCE REGARDING HIS LIFE STYLE, HIS QUALITY MUSIC AND HIS LOVE OF DRUMS HAS PAID OFF. Recently, when Fox Broadcasting kicked off its new "Late Show" starring Joan Rivers, they wanted a high quality studio house band that could recreate the sound quality of a recording studio on the set, like a gated echo on a drum sound has never been heard before on live television. So they were serious. They hired Musical Director, Mark Hudson ("Flashdance"), and Sound Designer, Tom Wilson ("Maniac" and "Crazy For you"), they paid special attention to the set's acoustical design, and invested in state-of-the-art digital equipment from delays to reverbs to the microphones and the mixing console. Of course, they needed qualified musicians to interpret their needs and study the songs to be played to recreate the effects that made them special. 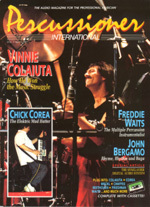 Vinnie Colaiuta was chosen as their house drummer. Now, you can hear and see live one of the world's most favored drummers every night at 11 P.M., EDT, play for Mrs. Rivers' guests, Elton John, George Benson, Sting, Kenny Rodgers, the Pointer Sisters, Mickey Gillie, Cher, Frank Zappa, and many others. Vinnie is playing with high quality musicians, high quality music for superb artists; he is exposed every night to millions of viewers and he still plays selective gigs, like recording and touring with Lee Ritenour. The music struggle may never be over, but Vinnie Colaiuta is one of those new generation musicians who knows the intricate combination between the music business and music that does not upset the balance of true artistry. The musical examples that I have contributed here illustrate a sort of temporary change in time signature, or the illusion of the tempo shifting momentarily when in fact it is not. I have chosen to call this rhythmic occurance "Superimposed Metric Modulation" for lack of better terminology, for that is exactly what it is. First of all, I say "superimposed" because one pulse, or time feel, is layered onto another already existing pulse, and because the layered pulse creates an effect of the time changing, I say "metric modulation". But, because the original time base remains intact (the tempo doesn't shift), and the second or layered pulse does not take the place of the already existing pulse , I call it "Superimposed Metric Modulation". This rhythmic device, when used musically, as with anything, can be very effective during certain places in a musical performance, and can create a very cleverly deceptive shift in feeling, such as in a fade out or out chorus of a tune or during a specific moment in accompanying someone's solo. In this example, I have used the quarter note triplet as the vehicle to transport the feeling of one tempo to another. Because of the feel in bar 3, it sounds as if the so-called "new" quarter note is a half-note triplet, not a quarter-note triplet. The accented notes represent quarter notes, as you can see. Also, I have reversed the imaginary tempo shift in retrograde to illustrate the sound of one tempo going to another and back to the original again. This helps in being better able to hear exactly what happens; plus, once you go into a change like that, you have to be able to get back out of it again. Bars 1, 2 and 3 repeat to show a smoother, gradual change and also to get a chance to groove a little for a moment, so that everything makes more sense. In conclusion, I hope I have shed some rhythmical light on something that can be fun when used properly. And, if you find that you have the place where you can use something like this, above all else, be musical!